Over the years, we’ve learned that after nesting, leatherbacks head straight to the Florida Current and head north. 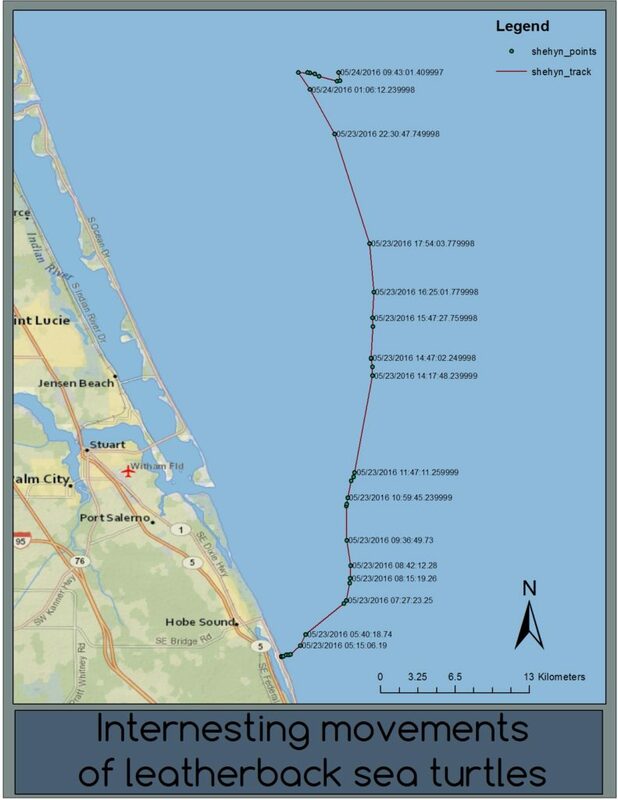 They take 2-3 days to swim north and eventually reach the Cape Canaveral area. There they do something very important that we call “The Turn.” If leatherbacks don’t turn there, it could mean that they’re done for the season and they’ll keep heading north. But if they make “the turn,” then we know they’re heading back this way for at least one more nest. So keep your eyes peeled on our WEBSITE and keep your fingers crossed that Shehyn makes “the turn!” If not, in about 25 days, her transmitter will fall to the bottom of the Ocean (as a safety measure) with all of its valuable data with it. This entry was posted in Blog Post and tagged biologging, leatherback, leatherback blog, migration, research, satellite tag, satellite tracking, sea turtle, shehyn, track, tracking, transmitter, turtle. Bookmark the permalink.